To understand how a menagerie of Western misfits, searchers, junkies, and fugitives ended up dancing to a mutant strain of proto-techno on a beach on the Arabian sea, you have to go back to the all-night psychedelic rock jams played over massive beachside sound systems during the 1970s. 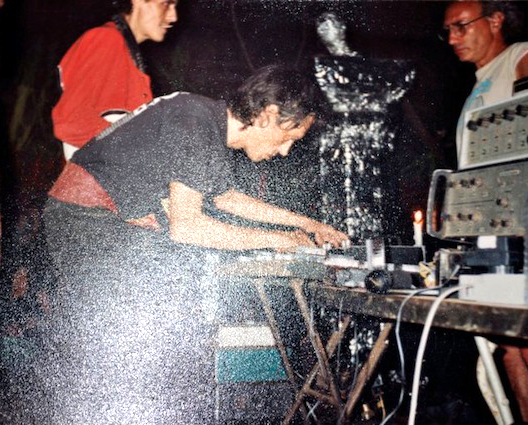 By the late 1980s electronic music and DJs had taken over the Goa dance scene. With the dust and heat of the coastal setting, vinyl was not a viable option for deejaying. Instead, DJs used cassette tapes played on professional Walkmans, which allowed for pitch manipulation and precise edits (vocals were often cut out of songs and hypnotic trance-like sections extended). The key player in the early Goa trance scene was DJ Laurent. Playing to a crowd tripping on LSD and charas, he was a master at weaving eclectic musical sources into an organic progression that could last from dusk until dawn; from ominous twilight grooves to blissed-out, sun-kissed climaxes. This according to “Unveiling the secret: The roots of trance” by Dave Mothersole (Dancecult: Journal of electronic dance music culture IV/1 ). Above and below, DJ Laurent in action.